Estuaries are the transition between fresh water and the open coast, sheltered water that is neither fully saline nor fresh. The New Zealand coastline contains 441 estuaries, whose environmental characteristics are recorded in the Estuarine Classification database. Estuaries support a wide range of human activities and values and are an integral part of the cultural identity of New Zealanders. Ecosystem services (services that humans value) that estuaries provide range from food, recreation, high value real estate and cultural identity to cleansing contaminants from water before it enters the coast. The diversity of estuarine services, and the ability of estuaries to maintain them, is reliant to a large degree on a suite of ecosystem processes, the diversity of habitats within estuaries and the pressures that each estuary is under from human activities. Estuaries are frequently thought of as being impacted mainly by activities affecting freshwater, for example, the end point of nutrient, sediment and contaminant inputs, or alterations to riverine flow regimes. However, estuaries are also directly impacted by sediment, sewage and contaminant inputs from the urban areas surrounding them, and by activities within them. For example, engineering structures, contaminants from marinas and ports, oil spills, invasive marine species, overharvesting and aquaculture. The ability to be resistant to all these activities and to recover once impacted is driven by recruitment and exchange of organisms with the nearby coastal waters. At present, 63 of the 441 estuaries are monitored by Regional Councils and unitary authorities, providing information across much of the country. Information about the monitoring is contained within the Marine Environmental Monitoring online catalogue). However, there is as yet no robust, overall method for assessing condition. Regional councils are trialling a range of report cards, for example the Auckland Council has developed reporting based on the health of benthic animals (Benthic Health Model). Department of Conservation is focusing on ecological integrity- a holistic term that seeks to capture our sense of nature, its functionality and self-maintenance. Many of the changes in our estuaries have undoubtedly gone unrecorded. For example, sediment from the land is a major pressure and increased sedimentation rates, changes to tidal flows, the ratio of sand to mud flats and the disappearance of widespread cockle beds (along with other native suspension-feeding shellfish) have all been observed. Mangroves have also extended and the fragmentation of habitats has been implicated in decreased ability of these habitats to provide biodiversity. 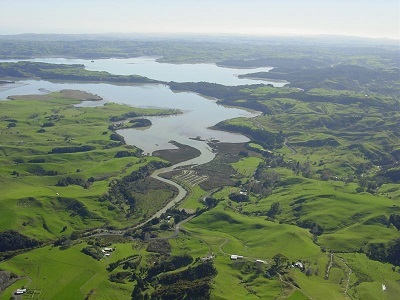 For some estuaries effects have been recorded, for example, terrestrial sediment depositions in Whangapoua, nutrients from sewage in the Avon-Heathcote, and contaminants in Mangare Inlet. But are our estuaries generally degraded? Are we approaching critical levels of use that will result in a massive decrease in the services that estuaries provide us with? The answer is undoubtedly yes to both in some estuaries. In many others, the answer is we don’t know, either because we are not monitoring them, or because we do not fully understand how they function in response to a multitude of pressures. But, at present, despite the long history of use and impacts derived from both land and sea, many of our estuaries still have high habitat and species diversity. However, how long will this last? Our use of estuaries is growing, with increasing urbanisation and more intensive farming and climate change effects will also be high in estuaries. Dr Judi Hewitt is a marine ecologist at NIWA.